It is tough enough to have CLL, but for those of us on Medicare, the cost of some treatments can be prohibitive. The exciting and timely news that we have confirmed we know is that the PAN CLL financial aid fund is finally reopening on Monday, Nov. 28, 2016. We know it because PAN has chosen the CLL Society to be their partner for offering peer-to-peer CLL counseling. We have been working hard to train volunteers and to develop the policies and procedures needed to protect your privacy and offer robust help. The CLL Society is very proud to partner with PAN. Thank you for being part of the CLL Society. Unlike other web sites, we don’t require visitors to register to gain access to our material, but honestly the number of subscribers is a metric that our supporters assess when considering the size of our grant applications. Without significant grant support, we can’t possibly do everything we are asked.that patients request. If you like what we are doing, please spread the word and ask other friends to subscribe. It really helps. You know that tell us that the news, services, and updates we share are important, relevant and helpful. No one knows how long it will stay open, so if you need financial help for your meds, I would strongly suggest that you apply applying soon. So grab seize this early holiday gift while you still can and please tell everyone to join our community and sign up for our alerts and newsletters. We are grateful for your participation in our work. Preparations are underway for the annual meeting of the American Society of Hematology, or ASH as it’s commonly referred. We’re scheduling interviews with CLL experts, scheduling meeting with current and potential supporters of the CLL Society and preparing our poster for the CLL Poster Session on Monday, December 5th! So much to do, so little time. .
November 21st @ 7:00 PM in Duarte, CA, the City of Hope CLL Support Group will be meeting. See more information here. Saturday, December 17th - Post-ASH CLL Patient Educational Forum at City of Hope. The CLL Society, in partnership with City of Hope Medical Center and the Leukemia and Lymphoma Society will be hosting the 2nd annual Post-ASH CLL Educational Forum at City of Hope. Dr. Tanya Siddiqi will be presenting on the latest data on Diagnosis and Frontline Treatment and Dr. Steven Rosen will present on Relapsed Disease and Novel Therapies. You can access the flyer here and pre-registration is requested. We look forward to seeing you there. Saturday, December 10th in Los Angeles, CA. The CLL Society will present at the conclusion of this meeting to assess interest in forming a CLL support group in the west side Los Angeles area. More details in the flyer. Access it here. 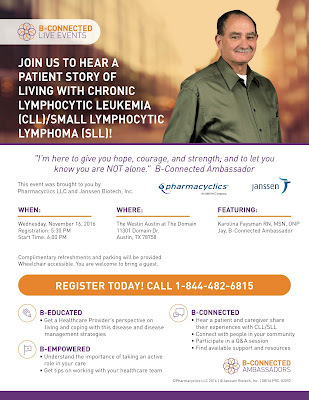 Do you live near Austin and have CLL? Do you or someone you love have CLL and live near Austin Tx? If so you might want to catch this event. The CLL Society will be represented there by the leader of our support group at City Of Hope and he will be talking about getting a support and education group going in Austin. The Westin Austin at The Domain 11301 Domain Dr. If registration doesn't pick up, it might be cancelled and that would be a shame. Today in the Conference Coverage section of the CLL Society website, we’ve posted a summary and link to the ASH abstract we wrote based on the results from our Reader Poll in the Q1 2016 issue of The CLL Tribune where we asked you about what was important to you when making treatment decisions for your CLL. You can view my article and see the abstract here. Leaving on a jet plane. Economy class. Red-eye. Tight connection in Germany. Leave on one day, arrive the next in Belgrade. Landing at the Nicolas Tesla Airport. This is another familiar story as I’m packing my bags to attend the 2016 CLL Horizons meeting in Serbia this week. I will serve as faculty and part of the steering committee for the newly forming CLL Advocacy Network, a global network of organizations representing people with CLL. The main goal of this first CLL Horizons conference is to build capacity for international patient advocacy organizations to support people affected by CLL. We're excited to announce that on Saturday, December 17th, in partnership with City of Hope Medical Center and the Leukemia and Lymphoma Society, the CLL Society will be hosting the second annual Post-ASH CLL Educational Forum at City of Hope. Dr. Tanya Siddiqi will be presenting on the latest data on Diagnosis and Frontline Treatment and Dr. Steven Rosen will present on Relapsed Disease and Novel Therapies. You can access the flyer here and pre-registration is requested. We look forward to seeing you there. 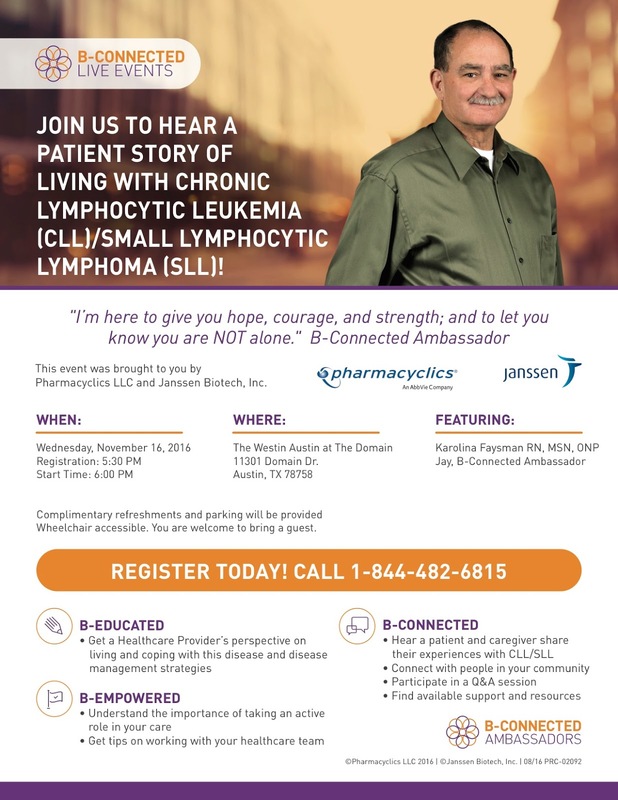 · Wednesday, December 14th at 6 PM at the Washington Marriott Georgetown in Washington DC: The Lymphoma Research Foundation will be hosting Updates on Chronic Lymphocytic Leukemia / Small Lymphocytic Lymphoma as part of their Ask the Doctor series. Dr. Chaitra S. Ujjani from Georgetown University Hospital is the featured speaker. You can find out more information and register here. Dinner will be served and there is no charge to attend. If you notice the little stethoscope by the title of our abstract, that denotes our abstract that is clinically relevant. We are pretty thrilled about our abstract being accepted. It was very competitive with several good CLL papers rejected. It is most unusual for an abstract by a patient or non hematologist to get accepted to the therapy sessions, Those are the sessions where there is the most action and traffic. Most importantly, we believe what we found in our little survey will make a difference in how patients are treated going forward. And we have plans for a much bigger survey next year if we can marshall the resources. Thanks to all of you who participated. Together, we are moving the needle.